Darrell D. Irwin, has been actively involved in the promoting of international engagement in academia. Previously, he was a Professor in the Department of Sociology and Criminology the University of North Carolina Wilmington (UNCW). In 2014 he became the Dean of the School of Sociology and Distinguished Professor at Central China Normal University in Wuhan, China. 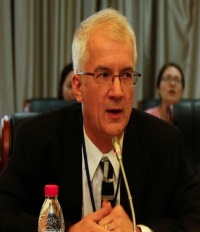 Dr. Irwin played a critical role in working towards internationalization and strategies to develop the School’s two disciplines, Sociology and Social Work, at Central China Normal University, a leading institution of higher education in China. He has written scholarly articles and given invited lectures throughout China on the Chinese system of justice and the history and mission of their police agencies. His research areas include comparative sociology, criminology, and substance abuse. He serves on the Editorial Board of the Sage journal, Chinese Sociological Dialogue. His publications include a book, and numerous articles in criminology and sociology journals. Zhang, Dawei; Irwin, Darrell; Jiang, Shanhe; and Haoyue Zhang. Corrections”. The Prison Journal. (forthcoming). Criminology. 8th Edition. C.H. Beck, 2018.
the Development of Rural Community Corrections”. In Donnermeyer, J. (Ed. ), The Routledge International Handbook of Rural Criminology. NY: Routledge. 2016. Leadership Confronts Corruption” Current Problems of the Penal Law and Criminology. 6th Edition. C.H. Beck, August, 2014. Publishing House: Foreign Scholars on Chinese Law. Beijing, China. 2014. Criminal Justice. Vol. 38, Issue. 1, 63-81, 2014.
to Displace Western Influence” National Strategy Forum Review. Winter 2013. Economic Downturns” in Mathieu Deflem. (Ed) Sociology of Crime, Law and Deviance Vol. 16. “Economic Crisis and Crime”. London: Emerald: 2011. Africa” Contemporary Justice Review. June, 12 (2), 157-171. 2009. Forum Vol. 7 (4) 11-26, 2007. Irwin, Darrell D. “Alternatives to Delinquency in Harlem: A Study of Faith-Based Community Mentoring.” The Justice Professional 15, (1) 1-8, 2002. Mid-Sized Cities” Journal of Crime and Justice Vol. 25 (1) 63-80, 2002. First Century African-American Social Thought. New York: Harcourt. 2000. Journal of Drug Issues. 29 (2) 365-380, 1999.